Note : Your request will be directed to Empower RF. The PCM5M5OGJ (SKU 7112) from Empower RF is a 30 watt solid state power amplifier that operates from 2620 to 2690 MHz. It delivers a gain of 42 dB with low distortions, and excellent group delay and phase linearity. This amplifier provides excellent performance and long term reliability by using Direct Injection Pre-distortion, advanced matching networks and combining techniques (Doherty Design), EMI/RFI filters, machined housings, and qualified components. The PCM5M5OGJ is available in a module that measures 4.4 x 6.7 x 1.1 inches with SMA female connectors and has built-in output isolator and control and monitoring circuits. 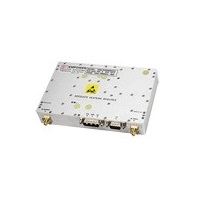 This LDMOS amplifier module is suitable for a wide range of applications, including LTE repeater applications.